This year I made a promise to buy more small lot Artisan wines. Support the little guy…right? 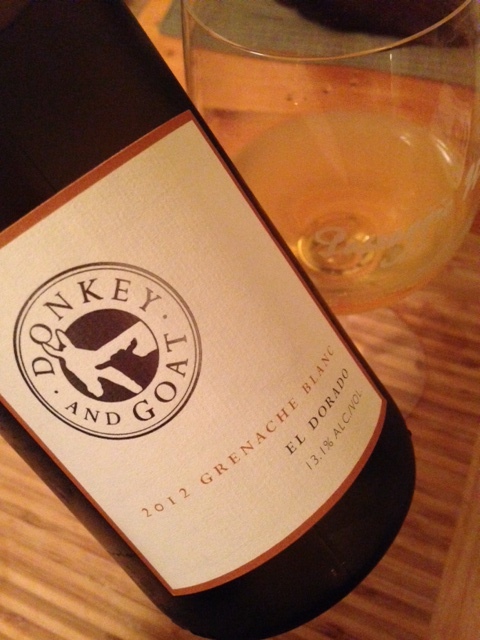 Jared Brandt, a friend of mine, who makes wine in Berkeley, CA, is the winemaker/owner of Donkey and Goat. He makes wonderful Rhone varietals, Chardonnay, and Pinot Noir. He was named one of the “wine makers to watch” in 2011. A few of his wines are featured in the Wine Enthusiasts Top 100 Wines of the Year. Needless to say, he is making great wines!! I, along with my good friend Stu Ake, decided to visit Jared last week. We just wanted to say hello and sip some awesome wines. Jared just happened to be at the winery. It was good to see that he was doing well. But best of all, we tasted some great stuff. I brought home a bottle of the 2012 Grenache Blanc.